The Arduino OBD-II Adapter works as a vehicle OBD-II data bridge for Arduino with open-source Arduino library provided. Besides providing OBD-II data access, it also provides power supply (converted and regulated from OBD-II port) for Arduino and its attached devices. Has an additional MPU6050 module built inside, which provides accelerometer, gyroscope and temperature sensor all accessible via I2C. The accelerometer can be used for measuring car’s acceleration and steering G-force. The gyroscope can be used for measuing car’s orientation without GPS. When the adapter is plugged and locked in the car’s OBD-II port, the MPU6050 module inside the case will always stay static to the car body, so the sensor data can reflect the movement of the car accurately. A programming guide using this module is available in the official Arduino playground. TEL0068 connects with Arduino through I2C interface (SDA/SCL). 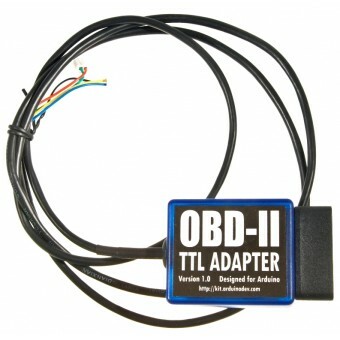 OBD-II data and embedded sensor data are both accessed via I2C. As the library has encapsulated all the necessary I2C operations, users don’t need to do any I2C programming to access the data. The library APIs are completely identical to that of TEL0066. The adapter stays plugged into the OBD port usually located under the steering column or slightly to the left of it. A cable comes out from the adapter and splits into one 4-pin connector two 2-pin connectors, including power lines (VCC/GND)and data lines (Rx/Tx or SDA/SCL). They can be connected to Arduino with onboard breakout pins or breakout shield. Your Arduino device will look tidy in car with only one cable. Get OBDII I2C Adapter - Accelerometer and GYRO from DFRobot Store or DFRobot Distributor.